Last weekend the Ohlmann Group team got together with marketing firms and advertising agencies from across Dayton for the industry’s annual bacchanal: The American Advertising Federation-Dayton’s Hermes Awards. Our own Jim Hausfeld, a past president of AAF-Dayton, served as Chairman of the event. 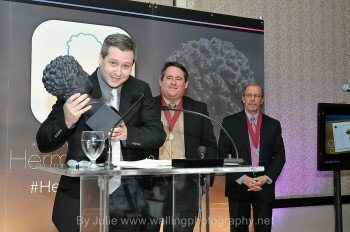 We were happy to have Jim with us, as the awards happened to fall on his birthday. Jim, along with Senior Art Director Andy Kittles, had even more to celebrate after taking top honors in the Integrated Campaign category. 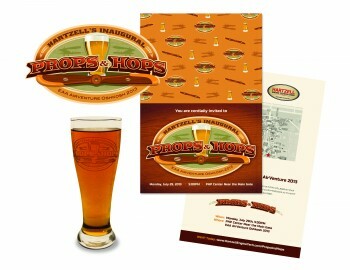 Andy accepted the life-sized bust of Hermes for his work on the Props & Hops campaign for Hartzell Propeller (below). Beyond the awards, the night held even more surprises. Walter Ohlmann, our CEO/President and fearless leader, was honored for over 50 years of work in Dayton’s advertising industry. He has shaped many lives, and we were happy to share this fantastic milestone with him. The members of the Ohlmann Group staff pitched in to get Walter a beautiful pin, which captures the Ohlmann Group logo in stunning solid gold. Speaking, I believe, for the entire staff — we couldn’t agree with Walter more. The Ohlmann Group is a fantastic place to work. Not only because we worked together to produce work worthy of nine awards this year, but because we enjoyed every minute of it. Doing what you love is a rare opportunity, and that makes the Ohlmann Group an even rarer place to work. We are all doing what we love. Want to see for yourself how much fun we had? Here’s a gallery of photos from the 2014 Hermes Awards. All of the photos in this post were taken by the incredibly talented Julie Walling, the full gallery from the night is available on her Flickr page.